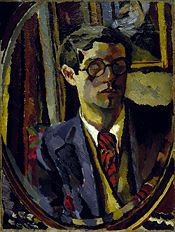 Self Portrait, 1920, National Gallery of Scotland. Duncan James Corrowr Grant (January 21, 1885 - May 8, 1978) was a Scottish painter and member of the Bloomsbury Group, an English group of artists and scholars (associated with the French Bohemians movement) that existed from around 1905 to around the start of World War II. The members frequently gathered to discuss aesthetic and philosophical questions, and believed most importantly in the value of friendship and truth. Members included Virginia Woolf and her sister, Vanessa Bell, together with her husband, Clive Bell. Grant was a cousin of John Grant, Lord Huntingtower, and a grandson of the second Sir John Peter Grant. Aside from his promiscuous relationships with other members of the Bloomsbury group, he is probably best known for his painting, in which, he is said to be the first to emulate the works of French painters, Paul Cézanne, and the Fauves in his own work. Duncan Grant died on May 8, 1978, in Aldermaston, Berkshire, England, and was buried in Sussex, England. Duncan Grant was born in Rothiemurchus near Inverness, Scotland, to a military officer, and his wife. Throughout his childhood, he studied art in various schools, including Slade School. He also spent some of his years as a boy in India. Upon his return to England, he continued his studies at St. Paul's School in London from 1899 to 1901. For the next five years, he attended school at the Westminster School of Art, and then, after he finished schooling in England, he traveled abroad, where he studied in Italy and France. During this time, he met two individuals who greatly influenced his painting style and overall work as an artist. In 1906, he met and apprenticed for French painter and writer, Jacques-Émile Blanche, and then in 1909, Duncan met Henri Matisse. After his return to England, his cousin, Lytton Strachey, introduced him to the Bloomsbury group, with whom he became life long friends. The Bloomburys, which included the Strachey brothers, Virginia Woolf, her sister Vanessa Bell, and her husband Clive, were well known for their interests in the arts and for their open relationships. Lytton was rumored to be Duncan's lover at one time. He would later become Vanessa Bell's paramour. In 1910, one of Duncan's paintings in a post-impressionist exhibition mounted in London was a big success. Duncan then joined the Camden Town Group in 1911, which further contributed to the Post-Impressionist exhibition of 1912, that was organized by the influential art critic, and Duncan's friend, Roger Fry. Throughout all the the Omega Workshops that Fry organized, from 1913 to 1919, Duncan participated and became more influenced by not only Fry's artwork, but the man himself. As an active and well-known homosexual, Duncan Grant is rumored to have had many relationships with men, particularly in the Bloomsbury group itself. Although all of these names are not known, it was rumored at the time that Roger Fry and and Duncan had a very intense relationship, although nothing of the matter has ever been proven. Through his meetings with Fry, Duncan Grant also befriended Fry's former lover, Vanessa Bell, who became the co-director with him on a number of projects, including the Omega Workshops, after Fry had given them up (1913–19). During this time, Grant wooed Vanessa while living with her and her husband, Clive Bell, and their two sons, before the start of the First World War. In 1916, Duncan, Vanessa, and her two children moved to the house named Charleston near Firle in Sussex. Duncan and Vanessa painted in Charleston and decorated the house itself, including the walls, tables, and all furniture, with their paintings. Shortly after their move, Clive moved in as well, although he and Vanessa resided in separate bedrooms. Clive's mistresses, including Mary Hutchinson, often accompanied him during his time in the house. On Christmas day, 1918, Vanessa gave birth to Angelica, who was fathered by Duncan Grant. However, Angelica grew up with Vanessa's husband's surname, and therefore, was known as Angelica Bell. Although Vanessa was madly in love with Duncan at the time, and remained so until her death, Duncan continued to have many relationships with other men, which were mostly nothing more than physical affairs. Because she considered him the great love of her life, Vanessa allowed such behavior while he lived in her home, as she understood that if she was to keep him at Charleston with her, she would have to allow him this freedom. The pain this decision cost her is related in Angelica's memoir, Deceived With Kindness, in which she discusses also her own pain over the deception about who her father really was. Although it is generally assumed that Duncan's sexual relations with Vanessa ended in the months before the birth of Angelica, they continued to live together until Vanessa's death in 1961. After this time, Duncan stayed on at Charleston until shortly before his own death. In 1919, Grant joined the London Group, and his painting changed from abstraction to the careful translation of nature in still life paintings and landscapes. He had his first of many one-man exhibitions in London in 1920, and in 1922, he began a collaboration with Vanessa Bell in interior design. This trend of interior design was completed all over their house together, and the two created and showed many pieces, from paintings, to linen, to furniture. Duncan also represented Great Britain at the Venice Biennale in 1926, 1932, and 1940. After World War II, Grant's fame subsided, but a revival of interest in his work began with a retrospective exhibition in 1959, and a one-man show in New York City in 1975. Among his best-known works are portraits of his Bloomsbury associates, in particular, one of Virginia Woolf in 1911. In 1946, at the age of 60, he met the young Paul Roche, who was to be the main love of his late life, as well as a serious threat to Vanessa. Roche's daughter, an actress and artist, Mitey Roche, also became close with Duncan, even learning how to paint from Duncan's private lessons. His work in the immediate post war period was considered unfashionable, but he continued working, mainly on decorative projects and private commissions. In the 1960s and 70s, however, his reputation revived and he continued painting and pursuing young men with a remarkable degree of success. His lover, Paul Roche went to considerable effort to tend to all of Duncan's needs in his later years, until his death at the age of ninety-three. Duncan Grant died of pneumonia at Aldermaston, in Roche's home, in 1978. He is buried beside Vanessa Bell in the churchyard of St. Peter's Church, West Firle, East Sussex. Duncan Grant worked on numerous paintings during his life time, including many collaborative projects. Most of Grant's work was tremendously influenced by French painters in a style of painting that still holds popularity in England due to Grant, as it implores "brilliant color aggressively applied straight from the paint tubes to create a sense of an explosion on the canvas." During his later works, Duncan was more subtle with the colors that he incorporated. His works are now displayed in the Louvre museum in France, the Tate Museum in England, as well as many other prestigious museums and art collections. Grant holds a significant place in British art history as an innovator of great talent, as an accomplished decorator, and as a painter of large and unequal achievement. At his best, he orchestrates a subtle, often mellifluous and sonorous arrangement of colors and forms, frequently weaving into his work allusions to other artists within the western European tradition of which he was a proud and sensitive inheritor. Besides his legacy as painter, Duncan is also remembered by those who knew him as a gentle man with a sweet disposition. His enthusiastic generosity as a critic of other artists' work derived from a firm conviction that, of all human activities, painting is the best. ↑ Frances Spalding, Duncan Grant, A Biography (New York: Random House, 1998. ↑ Richard Shone and Richard Morphet, The Art of Bloomsbury: Roger Fry, Vanessa Bell and Duncan Grant (Princeton University Press, 2001). All links retrieved October 6, 2017. This page was last modified on 6 October 2017, at 16:42.